The city of Fulton’s 2018 budget will be up for discussion at a public hearing set for Tuesday, December 12. The $16,492,000 budget will be available on the city website or at the Clerk/Chamberlain’s office a week prior to the public hearing. Members of the public can review the budget and weigh in at the public hearing on December 12, opening after the public comment portion of the regular common council meeting to begin at 7 p.m. at the Fulton Municipal Building, 141 S. First St.
Katko Is Representing His Constituents. Congressman Katko is representing his constituents in Congress and one only needs to look at his Federal Election Commission reports to realize who his constituents are; Virginia tobacco producer the Altria Group, Oklahoma’s Chesapeake Energy Corporation, Indiana pharmaceutical manufacturer Eli Lilly, Pacific Gas and Electric from California, Koch Industries of Kansas, the Florida Sugar Cane League and many others that will benefit from the current tax reform proposal and have donated thousands and thousands of dollars to Congressman Katko. State Police in Hastings are investigating a vandalism incident that occurred outside a residence on Bradbury Road in the town of West Monroe. The investigation has revealed that on November 26, between midnight and 8 a.m., someone damaged a garage door with spray paint and used a pick axe to damage two vehicles that were parked in the driveway. Using the Google Expedition Virtual Field Trip headset kit and administered by the CiTi technology staff, students from Mrs. Kompf’s kindergarten class were able to take a tour through a working dairy farm as part of an ongoing unit on agriculture. Renovations and improvements are in store for the Hannibal Central School District after voters approved a $42 million capital project Wednesday (Nov. 29). In a 157-50 vote, residents elected to move forward with the project, which encompass upgrades to portions of all district buildings. The renovations will come at no cost to district taxpayers, as the project is fully funded through a combination of state aid and the district’s existing capital reserve fund. On Wednesday night, the OHS Girls’ Hockey team traveled to Canton to take on the Bears in a non-league tilt. The Bucs opened the scoring with 11:39 left in the first when Stephanie Kubis got a nice feed from Hannah Koster that she put by Canton netminder Katie Premo (19 saves). The SUNY Oswego campus community looks to make spirits brighter this holiday season through the college’s 30th annual Toy Drive. The college works in conjunction with the Oswego County Department of Social Services to ensure that children from low-income families receive a present during the holiday season. Increasing clouds with rain showers likely later today. High in the upper 40s. 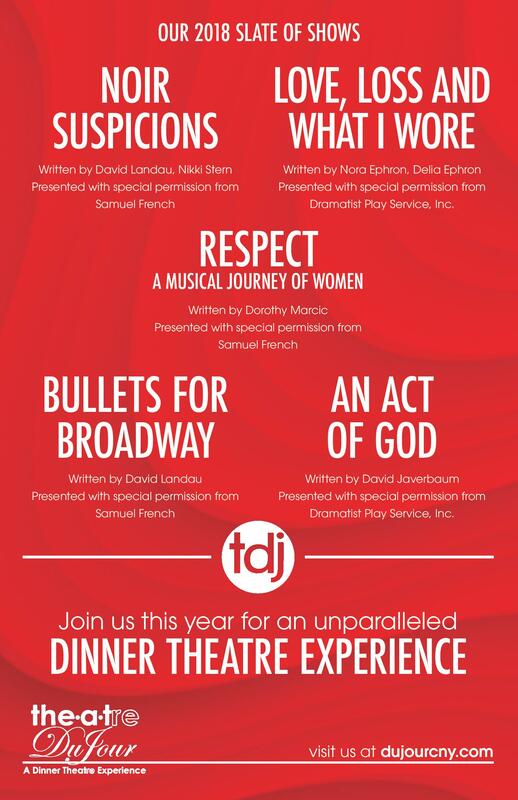 As it struts into year three as Central New York’s premiere interactive dinner theatre experience, Theatre Du Jour serves up diversity and sheer sass for its 2018 slate of shows. This year, TDJ is offering more from the inventor of interactive mystery play, David Landua to get the interactive, touring party started with Noir Suspicions.